The consumer market for smoke alarms in the U.S. and Canada is dominated by Kidde and First Alert, which are owned by separate business conglomerates, and Nest and other app-based entrants threaten to disrupt the market. Market leaders have very diverse product lines that include smoke alarms, where USI Alarms is more focused on consumer fire safety. In addition, USI’s lack of recognition on social media made occasional criticism and negative reviews more poignant, vexing management. Several years prior to this engagement, they had substantially invested in “social media” and had very little to show for it. USI management wanted to use social media to educate key market niches about smoke alarms, to build brand awareness, and to create good will. Ultimately, management wanted to drive additional ecommerce sales once they had established their products’ superiority and goodwill. CSRA served as subject matter expert and engagement leader, using its Social Network Roadmap(SM) methodology for experiential social media and social business transformation. CSRA partnered with ReputationTree and mentored their four-person team in several experiential social media processes of the Social Network Roadmap. This engagement unfolded in two phases: in Phase1, CSRA used the Social Network Roadmap processes and tools, namely ethnographic research of social media, to create the social media plan, which was implemented by ReputationTree for four months. Then, in Phase2, CSRA helped build and subsequently led the experiential social media team for four months. Created the social media plan by conducting a brief ethnographic study of key stakeholders (niches of people with specific characteristics) and workstreams (their actions relevant to smoke alarms). Designed tools to filter the digital social web for stakeholder interactions and workstreams and then to determine optimal social venues in which to engage them. Conducted several levels of behavioral analysis of interactions. Provided light weekly guidance to ReputationTree’s social media team for 4 weeks. Where Phase1 had emphasized social media content and light interaction, Phase2 reversed the balance to emphasize interaction. 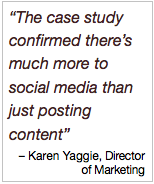 In a sense, Phase1 served as a control for the Phase2 experiential social media case study. Analyzed the results of Phase1, and created an experiential social media plan, which specified four stakeholders and separate interaction templates (guidance for platforms, topics, techniques for each stakeholder). Unlike typical social media “calendars,” experiential templates include behavioral information and tools to interact, and they only use content to support interaction. The templates were: false alarm, family, product-focus, and professional (installers/recommenders). During the first two months, CSRA mentored team members in experiential interaction, the team iterated tools, and we gathered baseline metrics. We learned what worked and what didn’t with each stakeholder template. In month3, CSRA segmented each template into more specific niches. Each segment included several filters, a tag taxonomy, and tools to enable team members to learn rapidly and increase results in real-time. CSRA tested segments for relevance and quantity to decide which to engage (we chose the prevalent niches most relevant to the technical advantages of USI’s products). For example, the family template was segmented into children, pets and elderly because there were huge numbers of conversations we could engage. Segments dramatically improved the quality of interaction since they enabled team members to focus interactions. In month4, the team leveraged month3 learnings by focusing on optimal stakeholder segments and tripling the number of interactions. Building on the trust the team had developed in each platform, introduced USI Alarms’ products into conversations when it added value to stakeholders. Also in month4, the team began using Facebook notes for long-form sharing by team members who had developed specialized knowledge of the fire safety and smoke alarm situations faced by their stakeholders. Then promoted the Notes on Twitter. CSRA built a Facebook Tab to synthesize and curate hundreds of links and references to support month4’s strategy, empowering people frustrated by nuisance alarms. It explained the “smoke alarm bugaboo” in two paragraphs and showed how the two prevalent types of smoke alarms performed in specific household scenarios. It introduced USST/IoPhic alarms as “the third way,” and included deep links into USI Alarms’ product pages from the Facebook Tab. CSRA built “reference graphics” from the University of Maryland study for the team to use when talking about the performance of ionization and photoelectric alarms, the two dominant types on the market. Introduced USI Alarms’ software-controlled “Universal Smoke Sensing Technology” (USST) alarms into conversations. Educated people about when each type of alarm performed best. Designed experiential metrics to reflect changing levels of trust exhibited by stakeholder behavior. Built reporting formats for monthly client status calls. CSRA worked one of the templates as a team member while mentoring three social media team members and one project manager. Specificity makes interacting easier because it increases relevance and empathy. 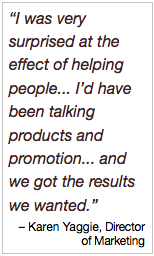 When CSRA segmented stakeholders, the team understood them more and had more to share. Mirroring stakeholder behavior improves results. We shifted away from our original network building strategy toward interacting episodically because few stakeholders discuss smoke alarms at length, but they’re passionate when they do. Scaling quality interactions produces breakthrough results. During the first three months, we researched and iterated our experiential approach, and it scaled beautifully in month4. Negativity can’t hurt us; it actually helps us build reputation faster. We served frustrated people as other people, by encouraging interaction and helping them. No one can be angry for long when they are being helped. Bloggers spawn rich interaction because they can describe smoke alarm situations from stakeholders’ perspective, and they are usually on multiple social media channels where we can engage. Facebook works for testing; we tested the landing page concept quickly and inexpensively before building the web version. Twitter helps build Facebook pages. We shared extensive links to detailed Facebook posts and notes and drove up the number of Fans. As detailed in Rollout, CSRA was involved in two phases of social media for USI Alarms, so we have rich insights from each phase’s results. Ground0: prior to CSRA’s and ReputationTree’s involvement in Phase1, USI Alarms had engaged a PR firm to publicize its release of the breakthrough Universal Smoke Sensing Technology (USST, IoPhic), and the PR firm had launched its Facebook Page. Our analysis of the Facebook Page revealed that it was typical brand-centric content that did not relate to USI Alarms’ stakeholders. 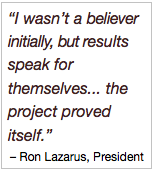 According to USI executives, the cost was significant and the results minimal. Phase1 was content-centric, but it included high-level experiential research, so content was relevant to stakeholders and their workstreams. 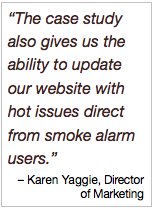 Phase1 improved USI Alarms’ digital and social mentions in help requests, positive sentiment, and smoke alarm conversations 120.4% in four months. 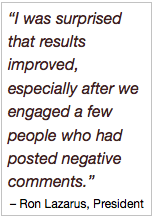 Phase2 improved USI Alarms’ digital and social mentions by 158.3% in the same rubric. This indicates that interacting with stakeholders specifically about their situations produces much better results than content sharing. Referrals to USI Alarms’ website revealed even stronger results. Phase1 increased social media referrals 2.88 times previous while Phase2 boosted referrals 11.33 times over previous. The Facebook Tab produced an astounding four times as many social referrals in June, and pageviews (pages/session) grew seven times over the average of the previous three months. This indicates high referral quality. Facebook results were stellar, both within the platform and its referrals to USI Alarms’ website. Even within the four month experiential pilot, Fans interacted with our Page’s posts 160% of the time. Fans grew 14% on a minuscule 33 average post reach. Our breakthrough came when CSRA launched the Facebook Tab, which summarized alarm types and explained where in the home each performed best. We introduced the USST alarm and provided deep links to USI Alarms’ product pages. The number of Facebook referrals and number of pages per session set new records. Twitter results set records across the board. Twitter is vital to experiential social media because it’s the most open popular platform, so our team could easily find and interact with stakeholders while they were in the midst of solving smoke alarm problems. Our interactions enabled us to deepen our understanding of stakeholder behavior and motivations. Results were impressive across the pilot, but they broke through after CSRA had segmented stakeholders, increasing relevance. Twitter referrals and pageviews to USI Alarms’ website set new records. Experiential landing pages bridge social media and ecommerce. The Facebook tab tested the landing page concept and set records for website referrals. CSRA attributes this result to the Tab’s organization by user situation and its recommendation of specific alarms for those situations. 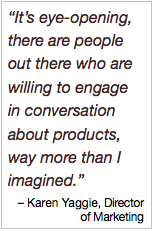 Notably, landing pages focus on user situations, not products, which are only presented to support users. Negative social media appeared, but it actually helped USI’s reputation. By serving angry, frustrated people in public, we showed how much USI Alarms cared about people and that we didn’t take ourselves too seriously. USI earned dozens of public thank yous from smoke alarm users—in conversations highly relevant to stakeholders. These expressions of gratitude can serve as endorsements of USI Alarms’ relevance to and care for customers. See also: The long text version includes a much more detailed discussion. See also: Presentation version on SlideShare.